The Hall of the Dead is a small gravesite located in the north end of the graveyard in Windhelm. 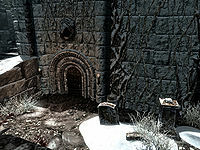 The entrance to the Hall of the Dead is located on the north wall of the graveyard, which is north of Windhelm's small market area. The entrance is a little dreary, as befitting a crypt, with only a couple of food barrels. Down the stairs, is a T-junction. Turning left you enter Helgird's chambers. The room is elongated, and candles provide some ambient lighting. Straight ahead is a small table, which is rather bare. Looking to the left, find a set of shelves with only a bottle of wine and Alto wine. Leaning against the shelves is a knapsack holding a random book, a leveled potion of health, and some jewelry. To the right of the doorway, a low table holds Nord mead, and an iron dagger. Next is a wardrobe holding only clothes. Further into the room is the owned bed, but little else. Exit the room, and head south to enter the crypts. At the bottom of the stairs the doorway to the right opens to the shrine of Arkay, which bestows the Blessing of Arkay for eight hours when activated. The crypts are honeycombed into multiple sections, but hold nothing of interest.